This is a multimedia overview of RPS (radioisotope power systems), a type of nuclear energy technology that uses heat to produce electricity for powering spacecraft. The heat is produced by the natural radioactive decay of plutonium-238. RPS systems have been in use for more than 50 years, and could continue to support missions to some of the most extreme environments in the solar system. Advantages of RPS include: continuous operation over long-duration space missions, largely independent of changes in sunlight, temperature, charged particle radiation, or surface conditions like thick clouds or dust. 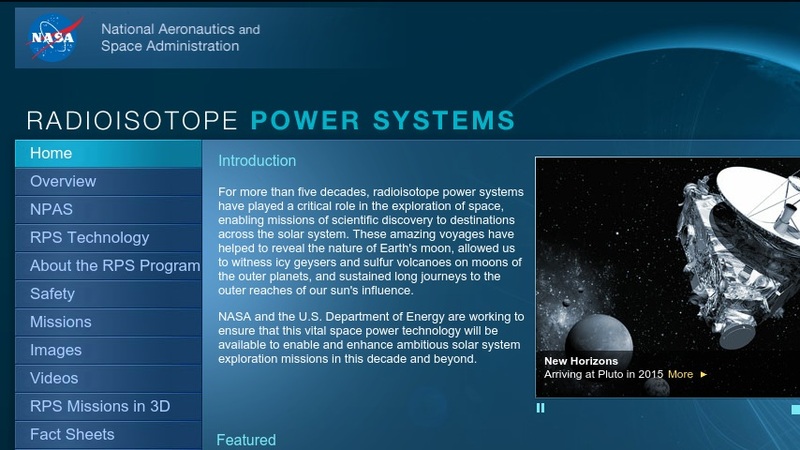 This resource is part of NASA's Solar System Exploration website. It includes videos, 3D interactive animations, illustrations, schematics of RPS components, and fact sheets about how the technology has been used in past missions.